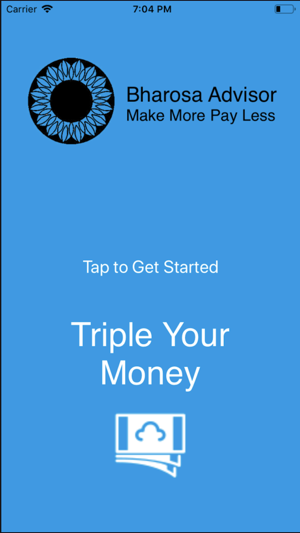 Bharosa Technoserve Private Limited presents Wealth Simple - Triple Money. Provide a platform to invest in Mutual Funds in India. Where we select the funds to invest your money based on our AI enabled research algorithm. Just add the money and relax, leave rest to us. 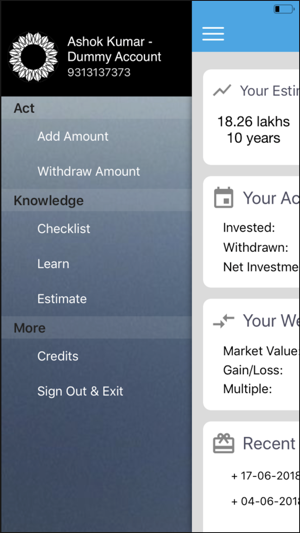 Analyse your portfolio anywhere, anytime with just a tap of your finger on your iOS device. 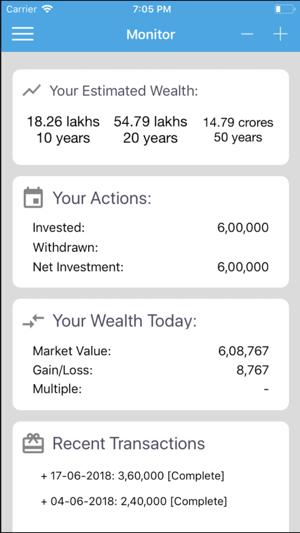 This app is designed to be used by every Indian, rich or poor, to be able to invest as little as Rs 100 in mutual funds and start their journey on the road to financial prosperity. The app will help in financial inclusion and reduction of poverty. It will be available in multiple Indian languages and is designed to be multi-lingual. Fixed deposits doubles wealth in 10 years while WealthSimple will triple wealth in 10 years. 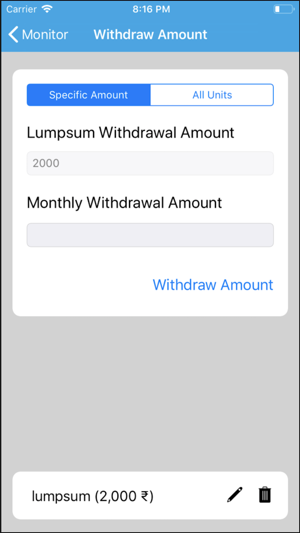 The user only has to Add money and Withdraw money which can be done one time or monthly. They do not have to worry about choosing the funds to invest in and adjusting the portfolio when markets go up and down. Rebalancing and tax optimization are done by the WealthSimple engine. The engine also uses machine learning to select top performing funds to invest in. The portfolio is adjusted monthly for performance, asset allocation and change in the equity percentage desired by the investor. 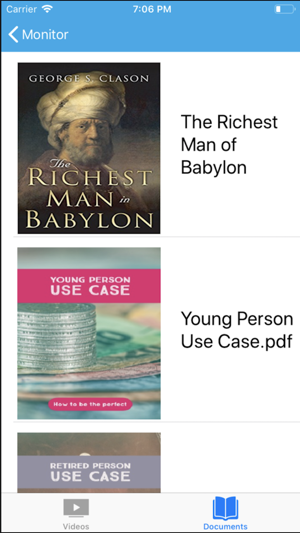 It can be used by minors, including a baby, young people, middle aged people and retired people. To use the app, a person does not have to be a Bharosa member. The app shows users the power of compounding and through videos and case studies helps them estimate how much wealth mutual funds can create and helps them with financial literacy. The app is expected to have users who have as little as Rs 100 to users who have many crores managed by WealthSimple. In USA, only 5% of actively managed funds beat the S&P 500 Index on a long term basis. In India, actively managed large and multicap funds beat the index, but more complex strategies do not deliver superior performance. WealthSimple is designed to deliver good performance along with simplicity. Currently many people in India use fixed deposits because of the simplicity and fixed returns. We have analyzed over 15 years of data and found that in 100% of the cases, WealthSimple beats fixed deposits by 2.5% and in 95% of the cases by over 4%. 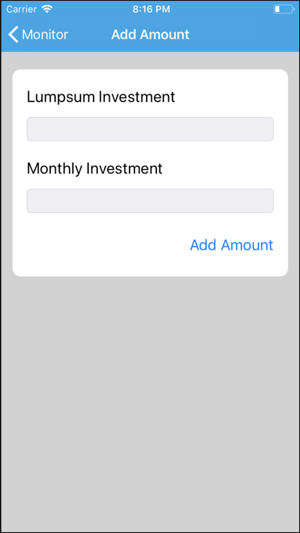 The conclusion is that WealthSimple delivers around 5% better performance annually than fixed deposits and is easier to use than fixed deposits once a user has completed set up.